Get your weekend bottoms out of bed early so you can enjoy a parade (everyone loves a parade, right?!) and then spend your day at LaVergne’s Veterans Memorial Park (115 Floyd Mayfield Drive) eating food, looking at and buying crafts, and listening to live music. It’s all free (except for the eating food and buying crafts part)!!! According to the city, the events begin around 10:00 a.m. and will end spectacularly (if I may editorialize) with a wonderful fire works show scheduled to begin around 8:00 p.m. I’m hoping my company will arrive by then so we can go see it!! What else do you want to know? 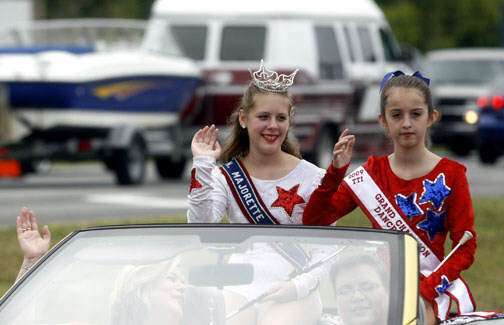 Parade begins at 10:30 a.m. Free concerts begin at 11:00 a.m. and you’ll hear from Adeline (waves at Tonya’s daughter! ), Kristina Craig, Twelve South, Brother Boom, Mason Douglas, Scott Smith and T. Graham Brown. Music begins at 11 a.m. Brown will begin his concert at 4 p.m.
OF IMPORTANCE: The northbound lane of Murfreesboro Road will be CLOSED beginning at 10 a.m. Traffic will be re-routed to the southbound lane, which will be a two-way street. anyone who needs to be out that day, should make arrangements to take other routes to get around town. Let it be known to the candidates (because you KNOW they will be out in full force tomorrow) that my vote will be solely based on how good the candy is that they throw at my kids during the parade. And Tootsie Rolls are an automatic vote for the other guy. That's just cheap. But I LOVE tootsie rolls! I would like to thank everybody who stopped by my Avon table today! The turn-out was great and I enjoyed meeting you all! I would love to be your personal Avon representative! I had an awesome day at Old Timers Day and met a LOT of really great people. I want to thank everyone who came by and met me for your support. I will try to get everyone who wanted a sign to them tomorrow. Again I want to thank everyone!!! I could not do this without all of you!